Stockton, CA is one of many cities across the United States that have faced the threat of water privatization. Mayor Gary Podesto played a heavy role in pushing the contract through city council, however local residents fought back to successfully put water back into the hands of the municipal utility. In 1999, Mayor Podesto proposed contracting out the operation and maintenance of Stockton’s water utilities. He argued it would save money and keep rates down while transferring the responsibility of complying with environmental and public health regulations. This despite the fact that privatization has been shown to often lead to increased accidents, losses and costs (as has happened in cities such as Atlanta, GA and Lee, Mass) as well as poor service and loss of local control . After receiving three bids from major companies, the $600 million, 20-year contract was awarded to OMI-Thames, Inc for management and operation of Stockton’s municipal wastewater utility . OMI-Thames is a joint venture between Denver-based OMI, Inc and Thames Water, Great Britain’s largest water company. Thames Water had the honour of recently ranked as the worst polluter in England and Wales by the Environment Agency inEngland and has been convicted of several environmental and public health violations, all of which the company was aware of and chose to pay the fines rather than maintain and operate water and sewer systems cleanly and safely . 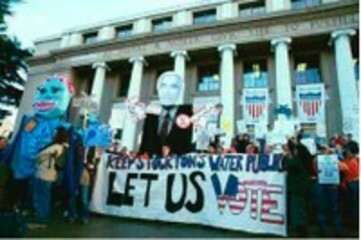 Concerned Citizens Coalition of Stockton (CCCoS) and Public Citizen responded to this proposal in 2002 by placing an initiative on the city ballot that would allow the public to decide if their water utility should be privatized. This vote would be held during a special election on March 4, 2003 . Despite these efforts, the mayor passed the contract through city council which voted in favor of the privatization deal . This decision occurred just 13 days before the city-wide referendum was to take place. The referendum won 60 percent voter approval but the vote was declared moot because of the earlier city council action. This action changed the focus of the debate from the pros and cons of water privatization to the issue of citizen participation and democracy . In response, CCCoS organized a referendum campaign to cancel the contract, going door-to-door collecting signatures. Despite obtaining 18,000 signatures, this was not enough to nullify the contract. Left with no other choice, CCCoS sued the City of Stockton for not conducting an environmental review of the contract as required by California law . To pass the contract quickly through city council a clause “exempting this decision from the California Environmental Quality Act” had been added . This illegal maneuver led to 2 court rulings declaring that the deal violated the law by failing to require an environmental impact report . Water privatization in Stockton gained international attention during this time because it was featured in the documentary film, Thirst . Stockton city council had the option of appealing the judge’s ruling but decided against this on July 17, 2007. In March of 2008, OMI-Thames had to return control of the utility to Stockton . During the three years of water privatization in Stockton, citizen watchdog groups reported cutbacks in preventative maintenance, noxious odors drifting from the sewage treatment plant, increased leakage from underground pipes, sewage spills and fish kills. OMI-Thames also refused to provide information about operations, profits and staffing . As one of the many cash-strapped cities in the United States turning to private companies to offset the enormous costs of repairing aging sewer pipes and upgrading treatment plants , Stockton Mayor Gary Podesto sought out privatization as the solution. He failed to consider the public’s input and overlooked the ability of the Stockton Municipal Utility Department (MUD). It has been noted that MUD had performed satisfactorily over the years and appeared to be well prepared for the future, specifically estimating that the savings it has gathered would yield enough money to make the necessary infrastructure repairs and expansion over the next 10 years . The failure of OMI-Thames in Stockton, CA was a huge blow to the idea that a private company can take over a community’s water supply and do a better job than public management. Stockton was the largest privatization in the western half of the United States. Incidents such as this one have led citizens to conclude that privatization of public assets, such as water, is against the public interest and for many, water is a fundamental human right, a responsibility of government and an essential for survival that must remain in the public domain to be managed for the benefit of all citizens and not for the profit of a few . Why? Explain briefly. Citizens were able to successfully stop the privatization contract through a lawsuit for failure to comply with environmental regulations after attempts to prevent the contract failed.